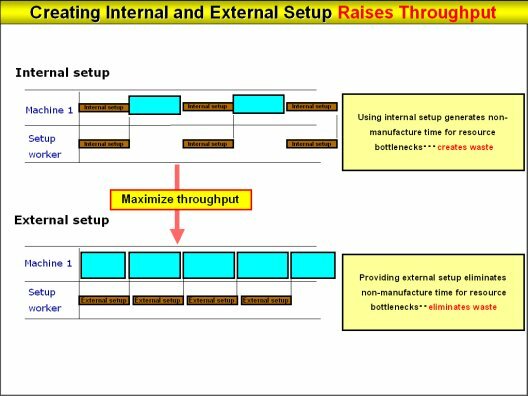 Q: Writings on production control often say that productivity can be improved by turning internal setup into external setup. What does that mean? How is it possible? A: Take a look at the diagram below. Internal setup are the setup made when the machines are stopped. No production activities are conducted while internal setup are going on. When we switch that over to external setup, we can operate machine 1 while the setup are being made. In this example, and in the same period of time, the volume of production with external setup is twice that of internal setup. I would assume that in your factories there are machines and equipment worth tens of millions of yen each. In this particular instance, machine 1 is a very high priced machine. When it seems as if orders are going to gradually and continually increase, you make examinations to see if you will invest tens of millions of yen to purchase additional machines like machine 1. However, before investigating whether to buy an additional machine, it would be very meaningful to first examine whether you should turn internal into external setup like those above. Then you may be able to increase production volume without investing tens of millions of yen. The simple programming of the Advanced Planning and Scheduling System allows creation of production schedules for external setup.